Free Pound of Dunkin’ Donuts Coffee When You Donate a Pint of Blood! 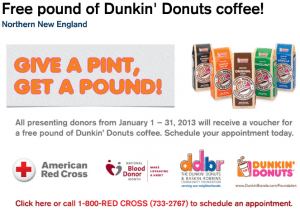 For the entire month of January, donate a pint of blood and get a voucher for a FREE pound of Dunkin’ Donuts Coffee! Start 2013 off right by donating blood, and get a little treat for yourself! Call 1-800-RED CROSS or make an appointment online to give blood this January!